You can configure settings for phone system, company name, caller ID, SMS and IM, time zone, voicemail, and more for your company under Company Settings. Under the Phone System menu, click Company Settings. Your company's phone system name, caller ID information, messaging settings, and time zone are displayed. Enter a New Phone System Name if you wish to rename your current phone system. Enter a new Company Name for your caller ID, if applicable. Note: This name appears on your outbound caller ID and on all invoices and communications from 8x8. This setting determines the language of the Telephony IVR messages such as voicemail greetings. You can also set the language for each user at the extension level. 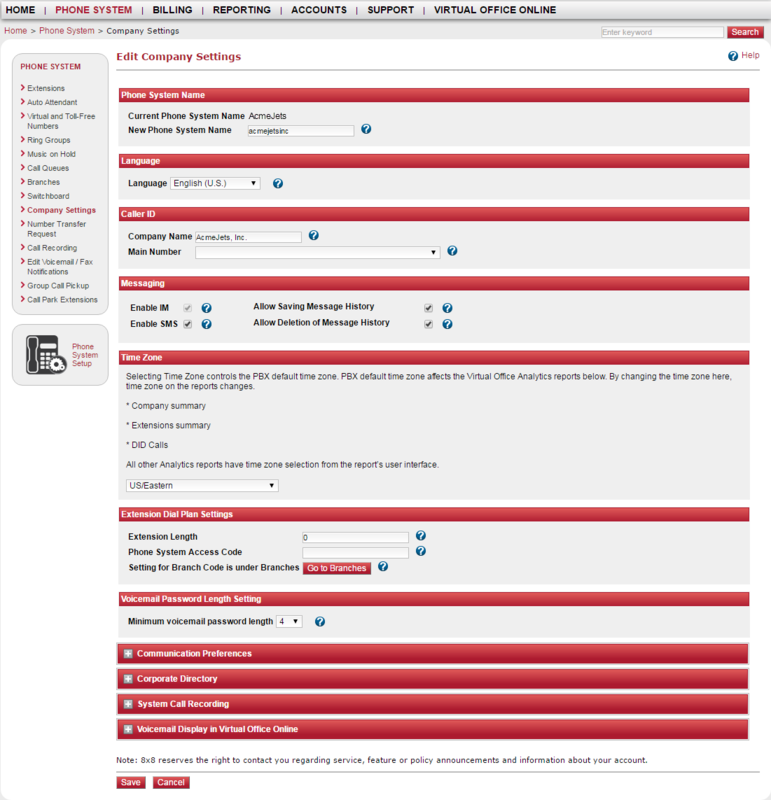 The extension level setting overrides the PBX-level setting. Note: The PBX language does not affect the agent's desk phone display. You need to select the preferred language for the individual extension. For details, refer to Edit Individual Extensions. Review the following table for the available localization settings. Click the Main Number drop-down arrow to select a new main number for your company, if desired. Note: This overrides the settings selected by extension users in the Virtual Office desktop app. When you enable IM and SMS messaging at the PBX level, 8x8 Virtual Office provides messaging access to your company contacts. Once IM or SMS are enabled, agents can save and delete message history. Agents can then send instant messages to one or multiple contacts, whether in the same conversation or separate conversations. They can also view message history and export the conversations as text files. By changing the time zone here, time zone on the reports changes. Other Analytics reports have time zone selection from the report’s user interface. Note: Extension dial plan settings are only applicable to enterprise customers with multiple PBXs and branches. Extension Length: The combined length of the branch code and short code. For example, if the short code is four digits long and the branch code is two digits long, then you must allow six-digit extension length. Phone System Access code: Identifies the PBX and is used for inter-PBX dialing. An access code must have the same number of digits across all PBXs. Note: All PBXs within the company must be assigned a phone system access code. Click Go to Branches to define or edit a branch code. In Voicemail Password Length Setting, you can set the minimum required length for voicemail passwords. The minimum chosen also affects passwords for Ring Groups and Call Queues. Changes to this setting do not impact existing passwords, but take effect the next time the password is changed. 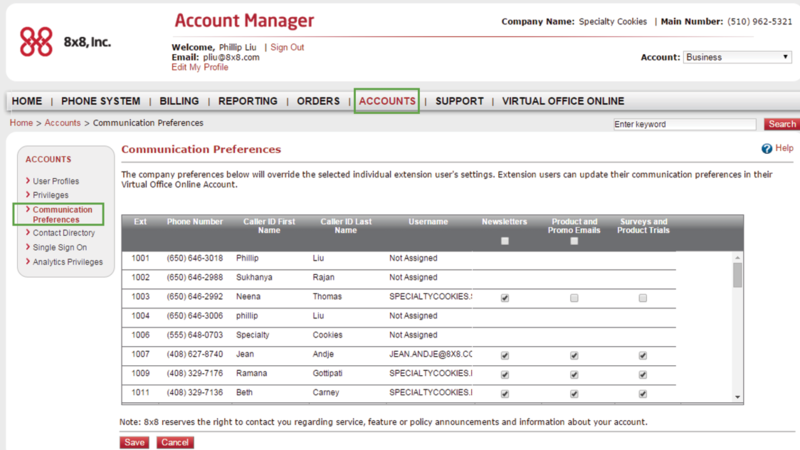 Go to Accounts > Communication Preferences to configure the company's preferences at the PBX or extension level. The settings override the selected individual extension user's settings. Extension users, however, can update their preferences in the Virtual Office desktop app.